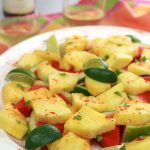 Spiced Pineapple & Watermelon – sweet juicy pineapple and watermelon slices, sprinkled with hot chili pepper and a twist of lime.What a wonderful way to spice it up! It is so amazing how simple this is, but it has such a complex taste. I was inspired by a picture I saw in a Crate and Barrel catalog, which happens to be one of my favorite stores. When I’m in the store I always spend more time and money in the store than I plan. I get so mesmerized when I’m surrounded by beautiful glasses, plates, bakeware, and gadgets for the kitchen or entertaining. I had some sweet juicy pineapples sitting on my kitchen counter and some leftover watermelon in my fridge, it was a no brainer, this was going to be a part of my weekend eats. 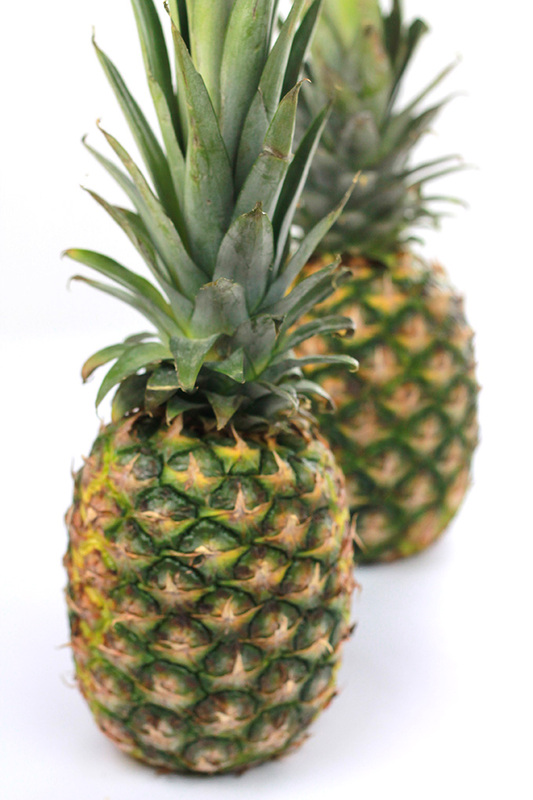 A quick tip about buying sweet juicy pineapples. I smell the bottom of the pineapple and if it smells sweet, it’s a good one. Another tip my daughter taught me is to twist off the top of the pineapple before cutting, I ended up not cutting too much off the top and if you want to grow pineapples, use the top to get it started. 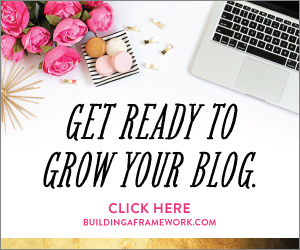 Learn how at Gardening Know How. My fruit was really sweet so I didn’t add any sweetener, but if you happen to get that not so sweet fruit feel free to drizzle with a bit of honey or agave. You could also add berries, mangos, papayas any fruit of you choice. 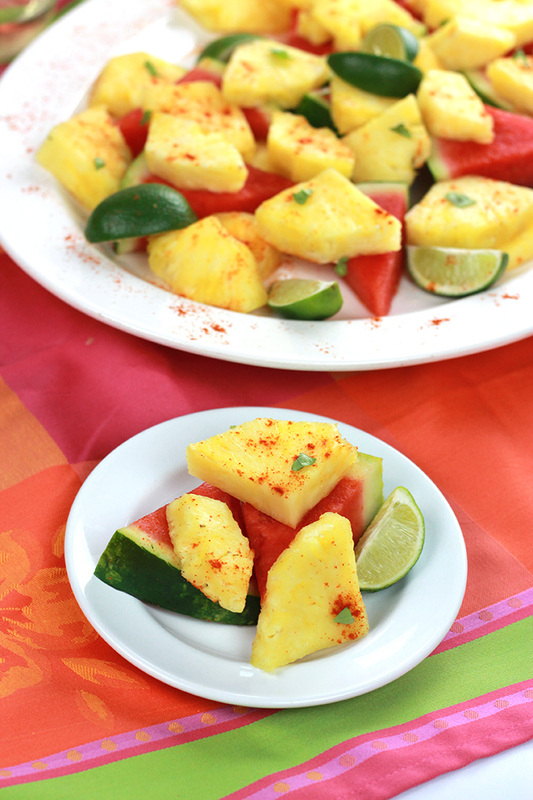 When making this Spiced Pineapple & Watermelon I placed the cut lime on the platter so that the guest could squeeze on a bit of lime juice only if they wanted. It adds a bit of complexity that not everyone enjoys. However, the sweetness of the fruit seems to balance out the spice of the pepper. Simply amazing! Peel, core and slice the pineapple. 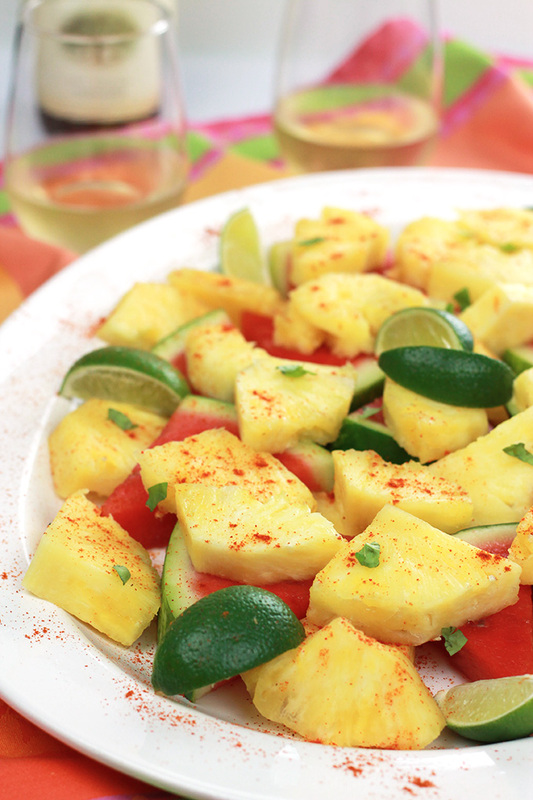 Place fruit on a platter and sprinkle with chili powder and torn herbs. Serve fruit with sliced lime. If you make this recipe or a version of it, take a picture and share with me on Instagram, tag it #thewholeserving or leave a comment below. I’d love to see or hear about your version of Spiced Pineapple & Watermelon. i would have never thought to try this combo but now I am intrigued and will have to try it! I am willing to even try with and without the lime to see which I like better. 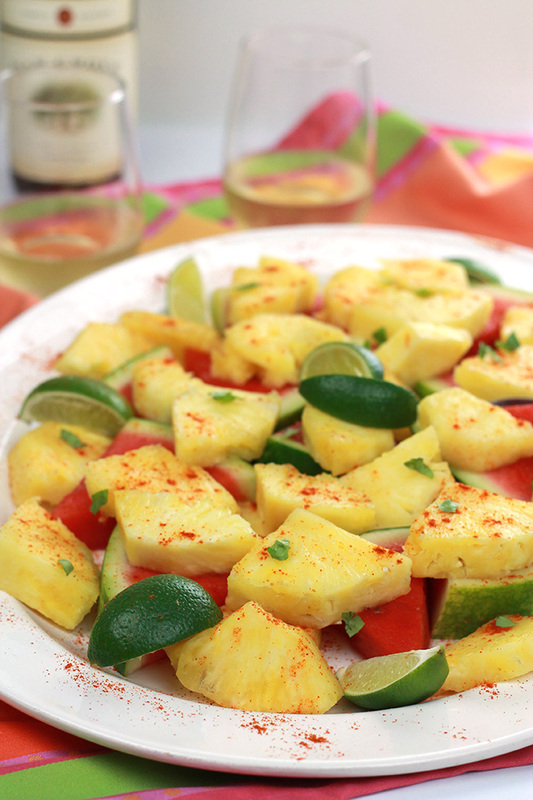 This is the perfect time of year to get some delish fresh watermelon so a great time to try this recipe for spiced pineapple and watermelon. It’s so delicious and the hot chili powder is good for you. I hope you enjoy this as much as we do in my house. Thanks for the tips on picking the perfect pineapple. I generally pull a leaf from the center, if it comes out with ease it’s ripe and sweet. I love this spiced fruit, it looks delicious! Hi Tonya, I hope you are having a nice week, it’s wet, wet and wet here in Texas. Enjoy! Hi Celeste, this looks good. I do make a salad with pineapple, tomatoes, sweetcorn and a sweet chili sauce, so your salad will appeal to the family. It won’t be long until watermelons are about in abundance. Wow, your salad sounds like something I need to give a try. I just happen to have some corn I need to use. Hi Kellie, I got this idea from a picture in a Crate and Barrel catalog. I really is delicious and I made a smoothie with the leftover fruit. Celeste, this looks like summer on a plate! 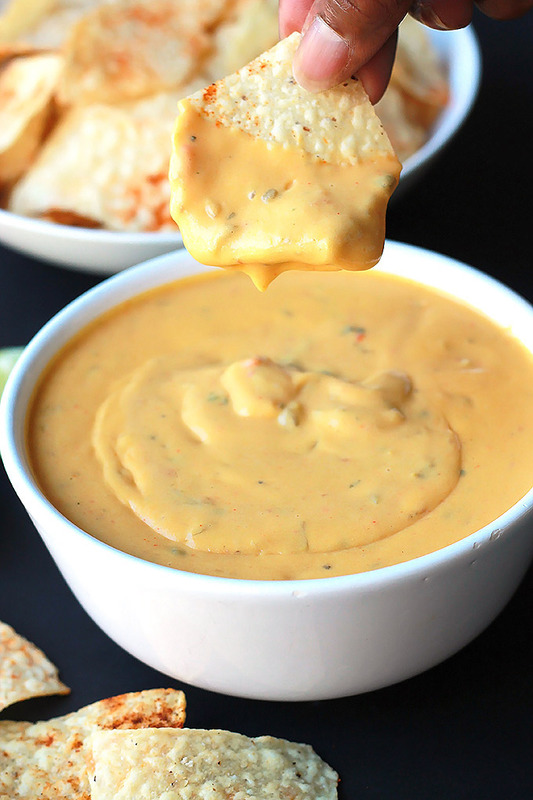 I love fruit salsas so I bet that I would enjoy this too. I would never have thought about pairing these flavors. That’s one of my favorite things about visiting you, there’s always a fun, original dish just begging to be made! I saw this on Saucy Saturdays! Very fun for the spicy people in my life!???? So simple I will try! Ps is twisting the top off the pineapple to make it easier to cut? Hi Michelle, I hope you and your family enjoy the recipe. And the twisting off of the top, well it makes cutting the pineapple easier for me and I find that I don’t cut off more then needed. And for anyone who wants to grow pineapples, the tops can be used to get that started. Thanks for the question, I noticed that a sentence was deleted that explained the reason for cutting off the top with a link to the instructions. I fixed that. Thanks! Thank you! I enjoyed the link on planting pineapple tops too! My husband will love this combo, great summer salad~Thanks for linking up to Merry Monday! Sharing on G+! Have a great week! I have not ever thought of eating these foods together with chili..but my mouth is watering!!! I love fruit and I love spicy and I’m so putting them together now! This looks refreshing! 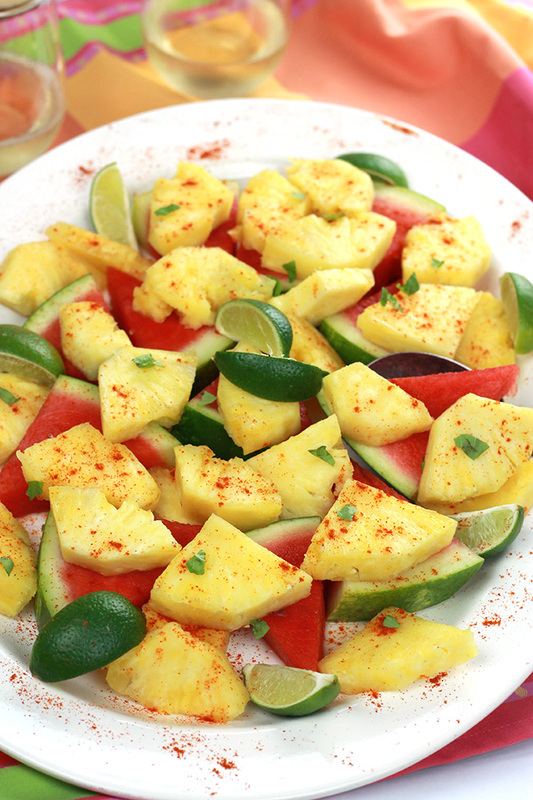 We love watermelon and pineapple but have never tried chili powder on them. Bet it’s delicious. Thanks Cristina, Have fun with it. Celeste, I’ve already printed this off and can’t wait to make it. Yummy!